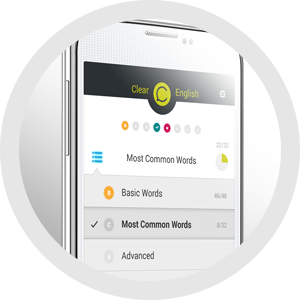 Perfect your English pronunciation with ClearEnglish! 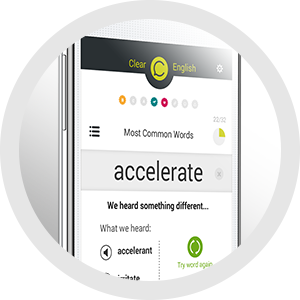 ClearEnglish is the fastest and easiest app for learning correct English pronunciation. Practice up to 250 new English words in just 20 minutes. 90-second lessons are scored automatically - try one quickly wherever you are, or take longer and beat your high score! Get ClearEnglish Here! It is the next best thing to having a native English speaker in your phone. 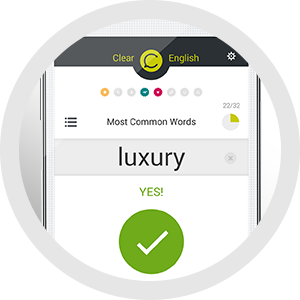 The ClearEnglish app listens to you and provides instant feedback to help you speak English clearly and quickly - the way you speak your native language. ClearEnglish covers thousands of English words. Choose from Basic English to Advanced English, plus word lists for TOEFL®, IT/Programming, Restaurants, Hospitality and Travel, Medical English, Legal English, even Romance! ClearEnglish will show you one word at a time, then wait for you to say it. After you speak ClearEnglish will analyze your voice and tell you whether you spoke clearly enough for anyone to understand you. All The Words Are Included. No Typing. All the English words you need are already in ClearEnglish. Words are organized into lists from Basic Words, to special vocabulary needed for school, job interviews and holiday travel. Tap any word, and ClearEnglish will tell you the perfect pronunciation. If you miss a word ClearEnglish will help you compare what you said to the way it should be spoken, letting you practice each word as many times as you need to,.